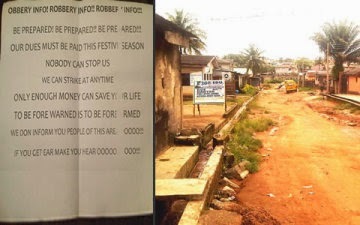 Residents of Onimaba, College Bus stop, Ikotun Road, Igando, Lagos have been living in fear since last week Thursday when a letter purportedly written by armed robbers circulated their streets. Punch Metro learnt that the letter, which was typed on an A4 paper and scattered on the streets, was noticed by residents as they woke up on Thursday morning. About 20 copies of the letter were said to have been picked up from streets such as Lateef Bello, Ogunbewon, Taiwo Adediran, and Alhaji Hamzat. During a visit to the area on Friday afternoon, Punch Metro obtained a copy of the letter. In the paper, the robbers wrote that residents should be prepared to ‘entertain’ them as they were coming for their end-of-the-year packages. The robbers added that they could strike the area at any time they deemed fit. The letter reads, “Be prepared, be prepared, be prepared. Our dues must be paid this festive season. Nobody can stop us as we can strike at any time. Only enough money can save your life. Speaking with Punch Metro, one of the landlords, who pleaded anonymity for security reasons, said the robbers also dispatched the letter to neighbouring areas such as Pako and Irepodun. He said, “On Thursday morning, around 4.30am when people normally start to go to work, we noticed the papers scattered on our streets. Some unknown persons, no doubt, had dumped the letter overnight in the area. The Lagos State Police spokesperson, DSP Kenneth Nwosu, however said the residents had yet to report to the police. He added that the public should always avail the police of relevant information to enable them ensure security of lives and property. they should not close their eyes while sleeping.